Going camping can be a lot of fun. It can also be very frustrating, especially if you do not have the right tent. If you are looking at buying an eight person tent, you have made a good choice. It has enough space for you, your friends, or your family to have a good time while at the same time providing everyone with the little bit of privacy on the trip. Are you still not sure which tent to purchase? Don’t worry. We have done some of the due diligence for you and are happy to present you with our gold, silver, and bronze products. We will even threw in one very nice budget option. Coleman has built a reputation as the leading outdoor product manufacturer. Their products are designed to be easy to use, durable, and to enhance your outdoor experience. There are a few facets of the Coleman 8 Person Instant Tent that you are just going to love. First, it’s large. It is 14’ x 8. There is more than enough room for you and your family to spread out and have your own space, while at the same time enjoying each other’s company. Its privacy feature allows you to divide the tent into two rooms. This means that the adults could have one room and the children can have another room. There is space for four air beds or for eight people sleeping in sleeping bags. Undoubtedly, the best feature about this tent is that it is easy to set up. The external frame and the tent do not attach to each other, so there’s no chance of you losing a pole or a fastener that you need to set up the tent. The setup is so easy that you can do it by yourself. However, with the help of just one other individual, you should be able to set up or take down this tent in less than 60 seconds. Just this feature alone makes the product worth the money. Think about all of the time and effort you spent setting up other tents and then not even had them go together well. With this product, this problem does not exist. Nothing ruins a camping trip like rain. Correction, nothing ruins a camping trip like rain in a tent that leaks. This tent has been designed to be waterproof and leak-proof. The tent was manufactured with Weather Tec technology, making it more than a match for serious weather. Some of the weatherproofing features of the tent include its veneered polyester waterproof webbing and zippers. Its seams at the poles are really strong, and the foundation as well as the floor of the tent are water resistant. The anchors that come with this product are exceptionally strong. These anchors provide enough security to keep your tent planted during high gusts of wind and even hurricanes. The tent is completely tarped. You do not need to worry about purchasing a separate rain fly. The heavy fabric used on the tent is double the thickness of standard tent fabric. 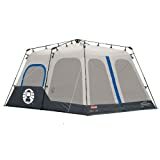 A nice feature of this tent is that you have the ability to keep the front of the tent open by rolling up the tent flaps and securing them with the straps that come with tent. This way, you can enjoy the nature around you from the comfort of your tent. In addition to having two doors, the tent comes equipped with seven windows. This means that you can enjoy full ventilation. Say goodbye to those old stuffy tents. The tent has a center height of 6’5”. This means that even taller individuals can stand up and completely stretch out while they are on their camping adventure. We strongly believe that the value of a product can be seen by how the manufacturer feels about their product. Coleman offers a warranty on this product that lasts for one year. This is a true vote of confidence as to the quality of the tent. When fully packed, the tent weighs 43.8 pounds. While this may be heavier than some of the other tents on the market, when one considers the quality of the material that is being used, as well as the thickness of the tent material, the weight is very reasonable. On Amazon.com, the more than 1,300 customers who reviewed the product gave it an overwhelmingly high 4.5 out of 5 star rating. Most of the positive comments revolved around the size of the tent, the ease with which it can be installed, the ventilation, and how the tent stood up to the rain. One reviewer who purchased the product for their children at a track meet said that the first time they put the product up and took it down, it literally took 60 seconds. The tent kept them cool on warm days and kept them warm on cool days. What they liked the most about it is that when it rained, they had a dry spot to hang out. They considered it money well spent. The Coleman 8 Person Instant Tent has unbeatable features that you just will not find in any other tent in its price range. You are able to enjoy time with friends and family, but at the same time maintain your privacy. It is the ultimate tent for anyone looking to spend time in nature and to enjoy the association with friends and family. As we mentioned in our gold product review, Coleman is one of the premier names in the world of outdoor entertainment. So it should not be surprising to find that another one of their tents finds its way to our number two spot. The Coleman Montana 8-Person Tent comfortably fits between four to eight people, depending on their size. It can also easily fit two queen-size air mattresses. While most larger tens have a flap door design, the Montana has a hinged door. This makes it so much easier to come in and out and really gives the tent the home away from home feel that you want from a tent. It is such a nice design for an outdoor family looking to enjoy a camping trip while at the same time feel protected from the elements. One of the nice things about this tent is that it has a generous 16’ x 17’ layout. The center of the tent reaches 6’2”, which is more than enough space for most individuals to be able to stand up and stretch in the tent. The front door of the tent is surrounded by a cool air port. This curved section of fabric that travels around the front door provides shade and helps keep the interior of the tent cooler. This coupled with privacy vent windows improves the airflow inside the tent as well as keeps everything fresh. Although you and your family are camping with the purpose of enjoying the great outdoors, this does not mean that you do not want to enjoy an electrical convenience from time to time. To this end, the tent comes equipped with an electrical access port. This allows you to run an electrical cable from inside your tent to an external power supply. Inside the tent you will see gear pockets that allow you to keep all your electronic products organized. Since the porch area in front of the tent is covered, there is a lot of room for you and your family to enjoy themselves outside while at the same time being protected from the sun. It is easy to see Coleman’s attention to detail when one looks at how easy it is to set up the tent. Shock-corded poles, continuous pole sleeves, and a unique pin and ring design make the setup process for this product a snap. The set up poles are color-coded. The Insta-clip pole attachments and the snag free pole sleeves mean that you can have this tent up and ready in as little as 10 minutes. Rain will not be a problem for this tent. You will appreciate the detachable rain fly as well as the fact that the stitching for the pole sleeves is inverted. All of these features are designed to keep the water out. The floor has a Weather Tec welded design that adds another layer of waterproof protection to this product. There is a bag for the stakes and for the poles. There is also a carrying pack that you can use to transport the tent. Instructions are sewn unto the bag, so that as long as you have your carrying bag, you have the directions on how to set everything up. Amazon has received more than 1,200 reviews for this product. It is rated 4.23 out of 5 stars, with almost 60 percent of reviewers giving the product 5 out of 5 stars. There were first time campers as well as experienced campers who gave their feedback on this product. All of them enjoyed how easy it was to set up and the amount of room that the tent provided. A constant theme in all of the reviews was the need to make sure that when you calculate the amount of people you’re going to fit inside the tent, you take into consideration camping gear and other supplies that will eat up some of the space. 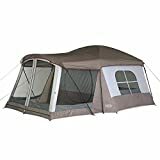 All in all, the Coleman Montana 8 person tent is an excellent product that can hold up to wind, rain, and foot traffic. It is just what a family or a group of friends needs to enjoy the perfect camping excursion. 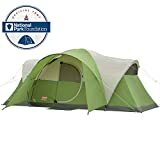 We selected this as our bronze pick because we felt like overall it was the perfect 8 person family tent. It does not have some of the features that you will see in the two Coleman tents we reviewed previously, but that does not detract from the value this tent offers. The tent is spacious. Your family and your friends will be protected from annoying bugs and mosquitoes. It is also durable. It can easily stand up to the rain, wind, and other unpredictable weather factors that can come up while you are camping. One feature that stuck out to us was the zippers. I’m quite sure you have seen tents that have zippers that stick or that are difficult to zip up and down. The zipper design that Wenzel uses on this Klondike tent is really one of the best that we have ever seen. It easily opens, easily closes, and you have no problem with the zipper getting stuck or coming off its track. You can really tell the attention to detail that Wenzel gave when making sure that the tent would not fall apart easily. Time and time again in our reviews, we discuss how important a good warranty is. It not only protects you if the product malfunctions, but it also serves as a stamp of trust by the manufacturer. Wenzel provides a 10 year warranty on this product. This means that you will get the full value for what you put into it. The tent itself has a 16 x 11’ base. This is more than enough room for 8 adults. The tent has a 98 ft.² interior space and a 60 ft.² outer room that is separated by tent walls. The inner room has enough space for at least five people. The exterior rooms have enough space for three people to sleep comfortably. And if you have brought tall people with you on your camping trip, they will appreciate the fact that the tent has a 6’5” roof at the center point. You can be sure that any camping gear you leave inside the tent will be safe and will be protected from the rain. Additional water protection comes from the weather repellent armor polyester fabric that the tent is made from. The frame is water resistant polyurethane and fiberglass. This means that you can sit back and enjoy nature, while at the same time not getting wet by nature. The tent is very spacious, and this is important especially on days when rain affects your ability to get outside the tent. There’s enough room for people to stand up, to move around, and thanks to the division of the two rooms, there is even a space to go if you want a little privacy. You have the option to have a full mesh roof, which provides ventilation while at the same time keeping the tent cool. The double stitch seams create a shingled effect that only enhance the tent’s ability to protect you from the rain. The floor is constructed of welded polythene. So you do not need to worry about dust, water, or mud penetrating the bottom of the tent. Since the tent only weighs 27.8 pounds, it is easy for any person in your family to carry it around. Amazon users love this product, giving it 4 out of 5 stars. Reviewer after reviewer use terms like fantastic, wind resistant, waterproof, and great value to describe this tent. If you are looking for something that you and your family can use while picnicking or will spending the night out in the woods, the Wenzel 8 Person Klondike Tent may be exactly what you are looking for. One of the things that we love best about the ConnecTENT is its versatility. You basically get two smaller tents that each sleep four people that are able to connect in order to have a big tent that sleeps eight people. If you are going camping alone or with just one friend, all you need to do is set up one dome. 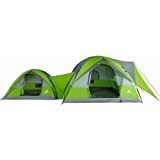 If you are bringing along the spouse and all of the kids, this tent works great for the entire family. It is also a great option when two couples are going camping together. All they need to do is bring along one tenant, but each couple has their own privacy. No matter who you mix up or where they sleep, eight people can comfortably fit into this two dome tent option. This tent has five doors and three windows, which adds even more to its versatility. We have chosen it as our budget product because of its affordability. In addition to wanting to enjoy the great outdoors, another reason why people are interested in purchasing tents is because camping is usually a lot less expensive than staying in a hotel when you are on a road trip or on vacation. If you have to spend an arm and a leg on a tent, you might as well have just stayed in a hotel. Not only is our budget product affordable, but you can fit a lot of people inside. This means the cost of camping can be shared with other campers, like friends who you invite along on your camping trip. The ConnecTENT is durable and will be able to handle rough camping. It has a polyethylene floor, which means that it will not leak when it is raining or tear on rough ground. It has polyester walls, which mean it is light, but it is also durable. One individual who commented on Amazon said that they set up the tent, went away on their hike, and then experienced a torrential downpour. They were worried that all of their belongings would be wet inside the tent when they returned. However, everything was dry and all they had to do was open the windows and doors to air out the tent. Individuals who camp after hiking a long way to the campsite or who boat there will appreciate the fact that it is lightweight. No achy backs because of carrying a tent for several hours. When it is set up, its dimensions are 10’W x 9’D x 72″H; 7’W x 5’D x 42″H. This makes it quite roomy for just a few people, but allows up to eight people to sleep in the tent. There is more to consider than simply calculating the number of people in your family and then purchasing a tent that will fit that specific number. You are going to want to consider a couple of other things before determining the sleep capacity of the tent you purchase. First, there is no industry standard that defines the size of a person who the tent fits. So four larger individuals may not feel comfortable in a tent that has been designed for four people. It may be better to purchase something larger than what you think you may need. Also, consider people who may be claustrophobic, like to stretch out a little bit at night, or if you plan to bring along a friend or even your dog. The vast majority of tents have been designed to be used during the spring, summer, and fall. This means that they are lightweight, are able to keep out the elements and insects, and are able to withstand rain, but they are not designed to endure heavy gusts of wind and snow. If you want a tent that is good for all four seasons, you need to purchase a tent that has been engineered to endure harsh summer and winter conditions. They are usually more sturdy and provide better insulation or ventilation. There are a variety of different tent styles available. The most common options that are available on the market are dome style and cabin style tents. A dome style tent is tall in the center and then has sloping walls. This is a great option for stormy, windy weather, but it reduces the amount of standing space available in the tent. A cabin style tent maximizes living space and may have additional features that can make camping more enjoyable. Some people do not mind crawling into a tent, falling asleep, and crawling back out of the tent in the morning. If you want to be able to stand up in your tent, you need a tent that is tall enough for your height. This is useful when you want to change your clothes and enjoy more space in the tent. If you are going to go on an extended camping trip, a taller tent may be more comfortable. When most people think of a tent, they just think that all tents have one entry and exit. However, many tents have multiple doors. This is something that is convenient when several people are sleeping in the same tent. This means that when one person has to use the bathroom in the middle of the night, they do not have to climb over or even accidentally step on other campers who are asleep. Some tents have extra accessories that either come along with the tent purchase or that can be purchased in addition to the tent. Some of this extra gear would include anchors and stakes that can keep your tent secure in different camping conditions, a broom and dust pan, a ventilation fan, a seam sealer, and other useful items. These extras can make your camping experience more comfortable. Camping is a fun activity for the entire family. It is a great way to see national parks, forests, beaches, and other places without having to spend an arm and a leg while on vacation. In order for you to enjoy your camping trip to the fullest, you must purchase a tent that is appropriate for you and your family. You want to purchase one at that is durable, lightweight, fits everyone comfortably inside, and even offers some extra fun features. Making the right purchasing decision can be the difference between having an exciting and relaxing camping trip and one that is frustrating because the tent you chose quickly fell apart or was too cramped.